Balanced steady state free precession (bSSFP) imaging has an established role in the CMR assessment of ventricular function and wall motion . However, measured bSSFP signals do not always agree with simple theoretical predictions. More accurate signal models would enable optimization of imaging parameters (e.g. prescribed flip angle and TR) in order to maximize signal-to-noise ratio (SNR) and contrast-to-noise ratio (CNR). In this work, we examine the effects of (A) non-ideal slice profile, (B) off-resonance, and (C) radiofrequency transmit (B1+) variation, to identify a model that accurately predicts myocardial signal behavior in bSSFP, over the range of imaging parameters routinely used at 3 T.
Experiments were performed on two 3 T GE EXCITE HD systems in five healthy volunteers. Cardiac bSSFP cine loops were acquired using a product 2D FIESTA sequence with prescribed flip-angles from 10° to 90° with 5° increments. The TR and RF pulse duration were fixed, and the imaging flip angle was adjusted by manually changing the RF pulse amplitude. Imaging parameters: FOV = 30 cm, matrix = 224 × 224, slice = 5 mm, 10 cardiac phases, 20 views per segment, TR = 5.0 ms (4 subjects) or 5.9 ms (1 subject due to SAR constraints). RF pulse: duration = 1.28 ms, time-bandwidth product = 2. Off-resonance maps were acquired in a single breath-hold using a cardiac-gated sequence with two different echo times (TEs). The TE difference was set to 2 ms resulting in a frequency range of ± 250 Hz. B1+ maps were acquired in a single breath-hold using the cardiac-gated saturated double angle method . Images from mid-diastole were selected for analysis, and regions of interest containing septal myocardium were manually selected. RelativeError = E(|SI measured -SI expected |/|SI measured |). Simulations assumed myocardial relaxation times of T1 = 1115 ms and T2 = 41 ms . Bloch simulation and image analysis were performed in MATLAB. It is worth noting that magnetization transfer effects  were not considered in this study. Figure 1 contains data from one representative volunteer including a comparison of normalized myocardial signal (measured) and three signal models (conventional, A+B, and A+B+C) as a function of the prescribed flip angle. The case A+B+C shows an excellent agreement with the experimentally measured values. Figure 2 contains the mean and standard deviations of the relative error averaged over all five subjects. The relative error decreases when considering more practical factors while the case A and A+C show similar performance compared to the case A+B+C. The appearance of myocardium in balanced SSFP images is influenced by imperfect slice profiles, off-resonance, and flip angle variation. We demonstrate accurate myocardial signal prediction using models that consider these three practical factors. 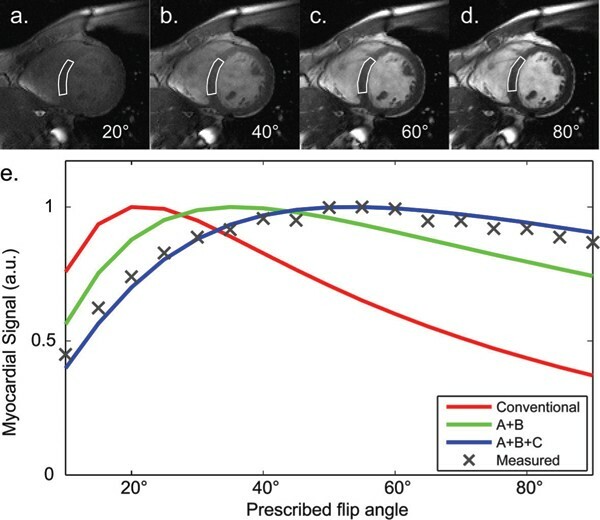 (a-d) Cardiac cine images with different prescribed flip angles. (e) The normalized myocardial signals (measured, conventional way, A+B, A+B+C) as a function of the prescribed flip angle. Relative error (mean and standard deviation) with different signal models. Accurate myocardial signal prediction can facilitate optimization of SNR and CNR in bSSFP, by guiding the selection of the imaging flip angle and RF pulse. The relative error between measured and theoretically predicted myocardial signal was reduced by 85% by considering three practical factors: non-ideal slice profile, off-resonance, and B1+ inhomogeneity.